Warm weather is approaching and that means firing up that grill! 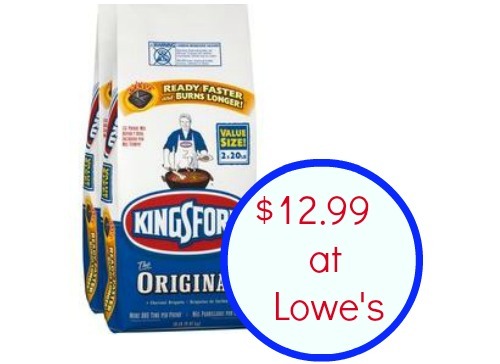 Right now, you can save 35% on a 2-Pack of Kingsford 20lb bags of Charcoal Briquettes at Lowe’s! The price has dropped to $12.99, regularly $19.99 for (2) pack. This is $13 for 40 lb of charcoal which should last you for a while! The lowest price we have found is on Amazon for $23.99 so this is a great deal. Stock up so you have plenty for the next season. Want an even better deal? Go ahead and order (2). You’ll automatically get an extra 35% off, making it $20.78 for both (that’s $10.39 each)! Offer valid through 4/14. Choose FREE in-store pickup!